Job seekers can send in their Morgan Stanley application for a chance to work for one of the most successful financial services companies in the world. It was founded back in 1935 and it currently operates worldwide. Morgan Stanley is also ranked 82nd on the prestigious Fortune 500 list, which makes it one of the most valuable employers out there. Morgan Stanley abides by the standard corporate schedule. If any schedule changes are required for the position, they will be included in the description of the position. The company’s hiring policy dictates that all candidates for Morgan Stanley employment must be at least 18 years old to be deemed eligible. Please note that candidates who do not meet the age requirement will be excluded from the hiring process. After they choose the career area that best suits their background, they will have to fill out an online jobs and employment form. Please note that they are required to send in their Morgan Stanley application online to be considered for their chosen positions. Morgan Stanley internship programs are aimed to find great young minds who show potential for the financial sector. Candidates can use the Program Finder feature available on the careers portal to find the department that is best suited to their talents. The feature will provide them with a list of programs that they can apply for so that they may find the ideal fit for them. Job seekers aiming for Morgan Stanley careers in the corporate and management sector can perform a personalized search on the portal to find the best suited options for their expectations. The company provides opportunities for employment all over the world, so they wherever their dream job might be, Morgan Stanley is bound to have a few offers. 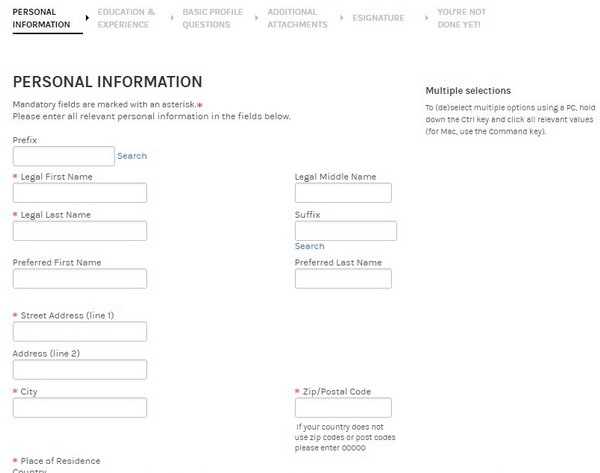 For this section of the Morgan Stanley application form, candidates must provide their complete contact details, including their full name, phone number, and address. This information will be used to identify them and to contact them regarding the following sections of the hiring process. Job seekers must provide their contact details for this section of the Morgan Stanley application form. Then they will be asked to answer three EEO (Equal Employment Opportunity) questions regarding their gender, race, and ethnicity. This information will be used for statistical purposes. Please note that job seekers are not obligated to provide this type of information about themselves. If they do not feel comfortable disclosing these details about them, they may choose the “I do not wish to provide this information” answers and they will be able to proceed to the following sections. Candidates will then be asked to mention how they have heard of the Morgan Stanley job they have applied for. For the final filed in this section, they will have to list the minimum salary they expect to receive in their position at the company. Job seekers must provide information about their academic experience for this section of the Morgan Stanley application form. 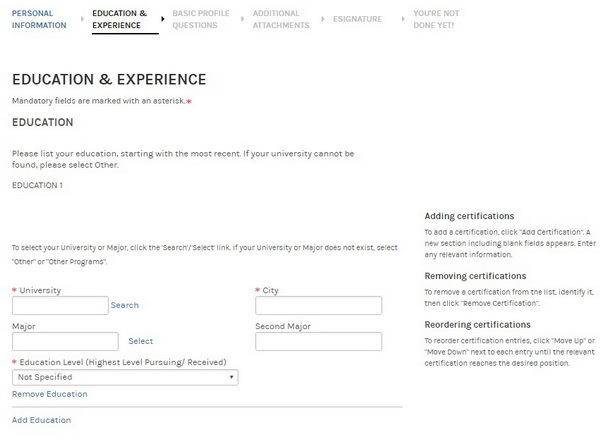 For this section of the Morgan Stanley application form, candidates will be asked to provide details about their education history, their work experience, and the certificates and licenses they have. For each of these, they will be asked to create an outline of their experience by listing the most relevant information about the academic programs they have attended, and respectively employment positions they have had. Job seekers must provide information about their professional experience for this section of the Morgan Stanley application form. 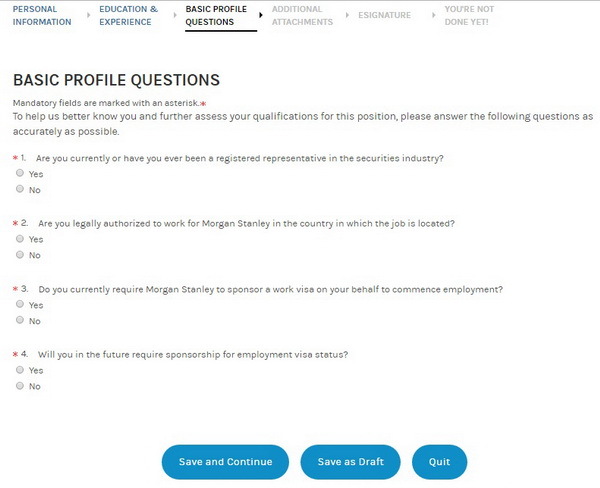 For this section of the Morgan Stanley application form, candidates will have to answer four questions about their ability to comply with the employment criteria enforced by the company. They will have to mention whether or not they have ever been registered representatives in the security industry. Candidates must answer the pre-employment questionnaire for this section of the Morgan Stanley application form. The Morgan Stanley application form then requires them to mention if they are legally authorized to work in the country where the position is located in. Lastly, they will have to mention whether or not they would require the company to sponsor a work visa for them during their employment. For this section of the Morgan Stanley application form, candidates may upload the documents they deem to be relevant for the employment process, such as resumes, transcripts, diplomas, and cover letters. Candidates can attach their resumes to this section of the Morgan Stanley application form. They may also include short comments about these files so that the Morgan Stanley hiring specialists understand why they have included them. 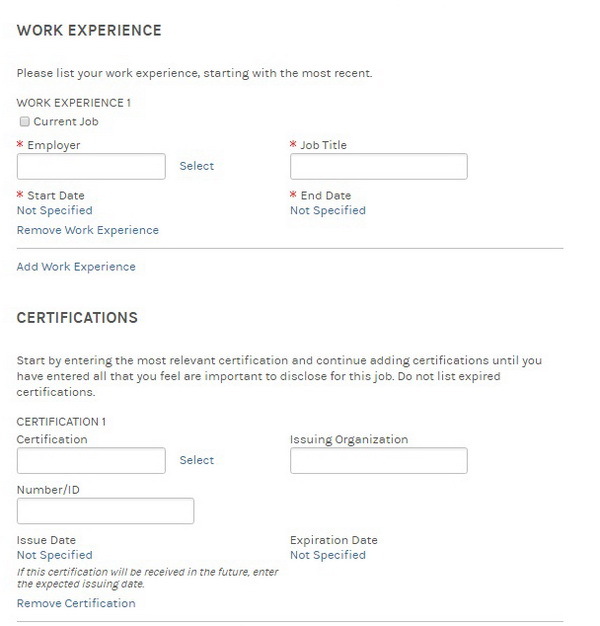 The portal requires candidates to mention which document is their resume. This section of the Morgan Stanley application form requires candidates to provide their electronic signatures to validate the document. They will be asked to certify that the full amount of data they have included in the online employment form is complete and correct, to their best knowledge. Please note that the company reserves its right to conduct background checks on the candidates applying for employment at the company to verify the accuracy of the information they provide. Candidates must be aware of the fact that inconsistencies in the data they provide may lead to their dismissal from the employment process. The sixth and final section of the Morgan Stanley application form consists of the notification issued by the portal to certify that the online applications have been successfully delivered to the company’s Human Resources department. Job seekers interested in Financial Advisors Morgan Stanley careers will find the latest job listings on the company’s employment portal. As for the corporate and management sectors, they will be able to personalize their search by selecting the location of their desired position. When they find the best suited Morgan Stanley career for their abilities, they will be asked to fill out an online employment application, which is very similar to the one we have described above. It includes the same sections as the form for corporate and management positions, except the “Additional Attachments” section. 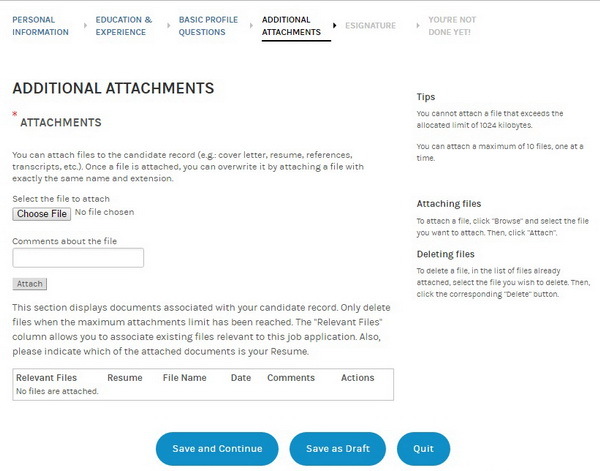 Since candidates will not be able to upload their resumes to the Morgan Stanley application form, they will have to include as much information as possible to the Education and Experience section, as this will be the only resource utilized by the Human Resources department to analyze their applications. After candidates submit their online forms, they will be able to keep track of their Morgan Stanley application status on the portal. It is important that they know when the assessment of their application has been completed because at this point they should expect to be contacted by the HR representatives regarding the interview process. Morgan Stanley internships are among the most competitive programs available. Interns get the opportunity to learn from some of the best minds in the field and to acquire very important skills for their upcoming careers. The best interns are usually offered positions at the company at the end of the program. The Morgan Stanley salaries offered to interns depend on the professional and academic background of the candidates. As such, they may vary from as low as minim wage to as much as $35.00 per hour. The vice president of the IT department works alongside the president to coordinate the entire operations of their subdivisions. They will ensure that the IT sector works properly at all times and they will determine new strategies to improve the performance of the department constantly. Morgan Stanley salaries for this position range from $107,000 per year to as much as $177,000. Please note that this is the base salary for the Vice President position and that employees will be offered performance bonuses as well, which will increase their overall rates significantly. Morgan Stanley Health Benefits: Medical, Dental, and Vision Plans, Paid Prescription Coverage, Health Savings Account. Financial Morgan Stanley Employee Benefits: Flexible Spending Account, Competitive Morgan Stanley Salaries, Morgan Stanley Employee Stock Options, Performance-Based Bonus System for Morgan Stanley Employees. Insurance Morgan Stanley Benefits: Basic Life Insurance, Supplemental Life Insurance, AD&D Insurance. Retirement Morgan Stanley Employee Benefits: Retirement Plan, 401(k) Plan. Special Morgan Stanley Benefits: Morgan Stanley Employee Discounts, Employee Assistance Program, Mobile Phone Discount, Gym Membership. Paid Time Off (PTO) Morgan Stanley Benefits: Sick Days, Paid Holidays, Paid Vacation. Candidates aiming for Morgan Stanley employment are advised to follow the instructions listed on the portal as best as possible. We strongly advise that they include as much information as they can to their online applications because these will be documents assessed by the HR specialists. Those applying for corporate and management Morgan Stanley careers should include their resumes, along with all of the additional documents they deem relevant, such as diplomas, transcripts, or references. The most important of these additional documents is the cover letter. Candidates should take the time to write one, as it provides them with the chance to point out what they could bring to the company and why they consider themselves worthy of employment. Neither the Morgan Stanley application form for corporate careers, not that for financial advisors features a section where candidates can proofread their forms before submitting them. It is crucial that their applications include correct information. As such, our advice for job seekers is to check the data they have provided after filling out each section of the form. Morgan Stanley applications are assessed by the Human Resources departments. The HR specialists will select the candidates who meet the company’s eligibility criteria, who are compatible with the company’s profile and who are prepared to perform the job requirements. These candidates will then be contacted to set up interviews so that they may be assessed further by the Morgan Stanley hiring managers. They will perform a detailed evaluation of their professional abilities, in line with the particularities of their departments, to find the best suited candidates for the open positions. Candidates aiming for Morgan Stanley employment must be able to convince the hiring managers that they are the best possible choice. Aside from stellar academic and professional references, candidates must display a targeted interest in the company itself. As such, it is crucial that they learn as much as possible about the current services that Morgan Stanley offers its customers, as well as the company’s development over its many years of experience. They need to show the Morgan Stanley hiring specialists that they understand the evolution of the company and they have an idea of what their specific contribution to their chosen departments could do for the further development of the company. Another aspect that candidates should pay attention to is knowing their own skills. We strongly advise that they go through their resumes before the interview and that they cross-reference their skills with the requirements of the Morgan Stanley career they have chosen. It is very important that they can explain exactly what makes them able to perform the main requirements of the careers they are looking to get. Lastly, candidates should focus on their looks as this aspect also contributes to the overall impression they make on the Morgan Stanley hiring specialists. They should aim for a professional and poised look. Their interview outfits should be in line with the career level they are applying for, as both overdressing and under dressing for the event will not work in their favor. Why did you apply for Morgan Stanley employment? What makes you prepared to perform the requirement of the Morgan Stanley career you have chosen? What is your strategy for gaining clients? Could you please pitch a stock to me? What can you tell me about yourself that is not in your Morgan Stanley application? Can any one help me how often they will contact candidates if they select the application(when they start contacting candidates after posting application). I am sure that if the position you applied for on Morgan Stanley suits you, they will contact you as soon as possible.